This year Boiler Room are diving Into the Dark to discover the best of underground techno culture across Europe. 8 cities, 8 parties and 8+ mystery world renowned DJ’s. The line-up of the parties will be announced the day before the event. 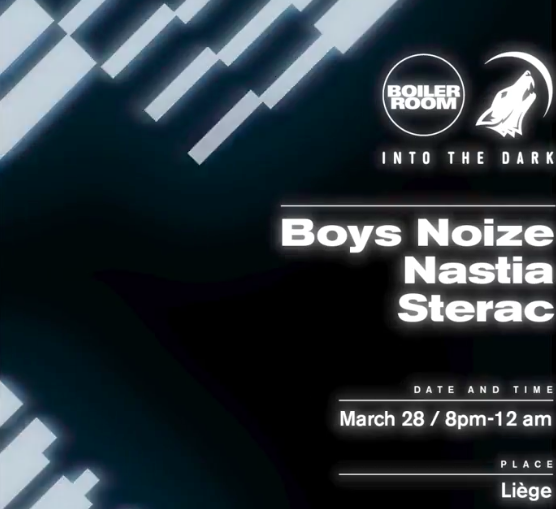 28/03/2018 Boiler Room & Eristoff invited Sterac to perform a 90 min set accompanied by Nastia and Boys Noise at a secret location in Liege! You can attend the event from your bedroom, catch the livestream!